The Manchaca All Stars, after 20 years, has finally produced a CD of the good music enjoyed by the locals at the Manchaca Firehall on Friday nights. This CD was recorded live, just as if we were enjoying the Firehall's fried catfish under the pavillions at the Clarence Vogel Community Center. On this CD, you will find songs and tunes that have become favorites of our audiences over the years. And, thanks to the contribution of Doug Taylor's bass skills, you will also find my harmonica doing its thing on many of the songs. This will be one of the few CD's you will ever find with a version of "Draggin' the Bow" on harmonica that holds its own against the fiddle. If you are interested in a Manchaca All Star CD ($10), write us at manchacaallstars@email.com. We will be proud as punch to set you up with one. Jim Strickland, a talented songwriter, has been pleasing audiences for many years. His gospel CD was stellar and was followed quickly by a compilation CD of some of his favorite songwriters (himself included). On these CD's, he also used the talents of some of his favorite local musicians (me included). I am glad that he got me involved with these projects, because they turned out wonderfully. If you want to see what everyone is all up about, order his CD's at www.frontroommusic.com. The Central Texas Bluegrass Association is proud to present their CD sampling some of central Texas' finest bluegrass bands. This long awaited CD has top-knotch bluegrass music from deep within the heart of Texas. Both economical and special, this CD boasts 28 tunes (both original and traditional) from 14 bands and only costs $10. (The association is using this CD as a fund raiser.) If you would like to hear central Texas' finest bluegrass, order your CD at www.centraltexasbluegrass.org/cdproject.html. If you are a harmonica player in the San Antonio area (Tx. ), then help them get this chapter started! HOOT is trying to get a San Antonio chapter going. If you are a harmonica player in the area, join up and give them a hand. For more information, check out HOOT at www.hoottexas.com. It's new, but it is off to a flying start. And it needs the help of San Antonio blues fans. For more information, check out their site at www.sanantonioblues.com They will be glad to talk to you. The Old Settlers Music Festival (Salt Lick Pavillion, Austin, Tx. ), is getting ready for the next festival (April 15-18, 2004). For the last 4 years I have given a bluegrass harmonica workshop at this festival that has been very well received. 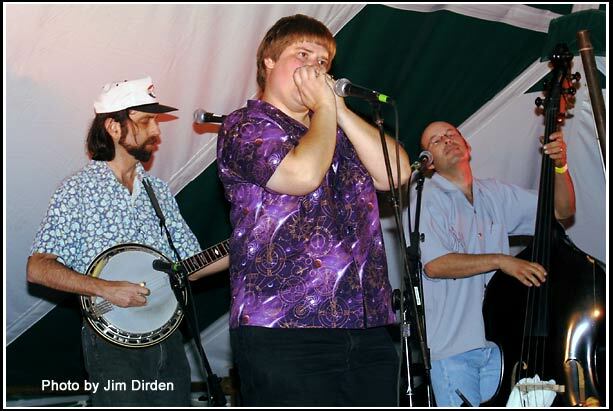 If you are interested in bluegrass harmonica, then put this festival on your schedule. The festival line-up every year is exceptional. Plenty of bluegrass. Plenty of other stuff. Included in the festival schedule is a young musicians contest. They have four simultaneous stages to keep you busy all day long and through most of the night. Check out www.oldsettlersmusicfest.org for more information. Camp Bluegrass & Swing Camp 2004 is scheduled for the week of July 18 through July 23, 2004, and will be held on the South Plains College campus, 1401 College Ave. Levelland, Texas 79336. Last year's Camp Bluegrass' faculty included Alan Munde, Wayne Shrubsall, Gerald Jones, Roland White, Steve Smith, Adam Granger, Dix Bruce, Ed Marsh, Joe Carr, Dale Morris, Tom Cook, and Tim McCasland. It was a blast last year, and we learned a lot. Swing Camp (with Slim Richey) was also a blast last year and will be again this year. With instruction, room, and board totaling around $500, you can take an economical vacation for a week and learn about your favorite music or instrument at the same time! These camps are worth the trip! Try them out! Also catch the Manchaca AllStars on the CTBA band sampler currently available from the Central Texas Bluegrass Association. And the new Manchaca AllStar Live CD has been released. After 20 years of playing together, we finally decided to take a chance and record ourselves! Order it from us at manchacaallstars@email.com.